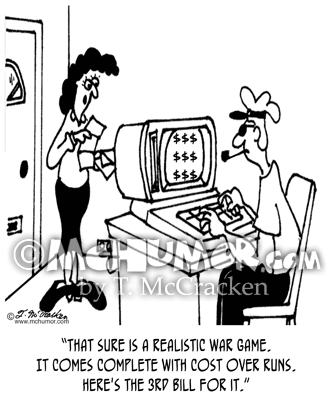 Game Cartoon 3366: A woman saying to a man playing a computer game, "That sure is a realistic war game. 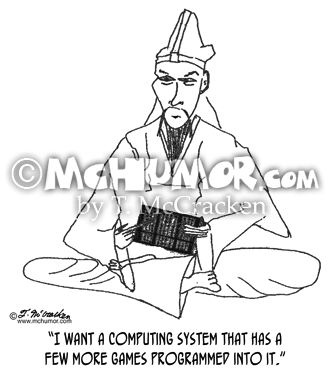 It comes complete with cost over runs. 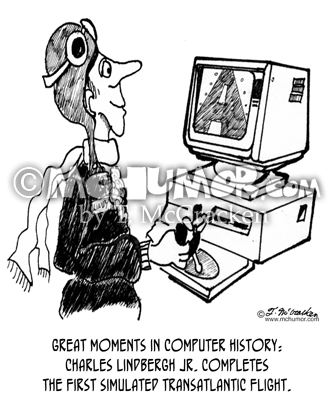 Here's the 3rd bill for it." 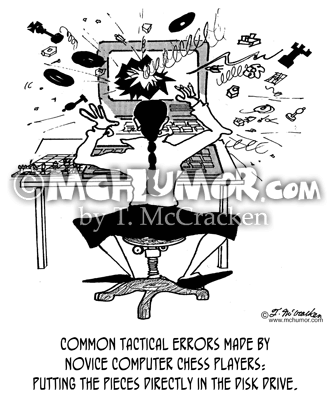 Chess Cartoon 2371: "Common tactical errors made by novice computer chess players: putting the pieces directly in the disk drive." A woman's computer blows up spitting out pawns, rooks, queens, etc. 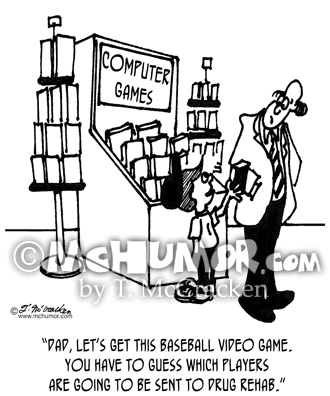 Drug Cartoon 3368: A kid buying a game saying, "Dad, let's get this baseball video game. 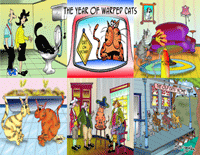 You have to guess which players are going to be sent to drug rehab." 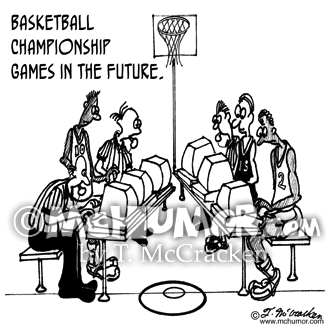 Basketball Cartoon 3254: "Basketball championship games in the future." 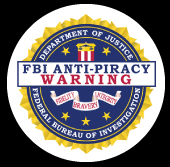 Players and referees sit at computer terminals. 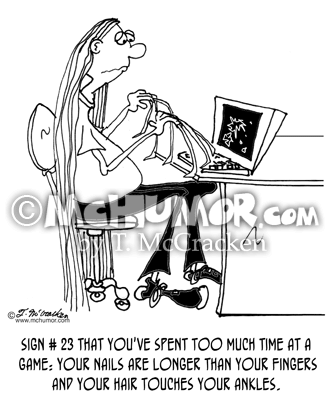 Flying Cartoon 3367: A queasy man at a computer screen says to his wife holding a bubbling glass, "More seltzer, please. 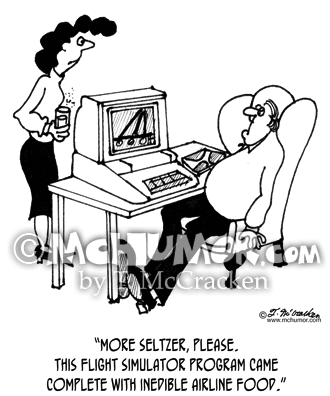 This flight simulator program came complete with inedible airline food." 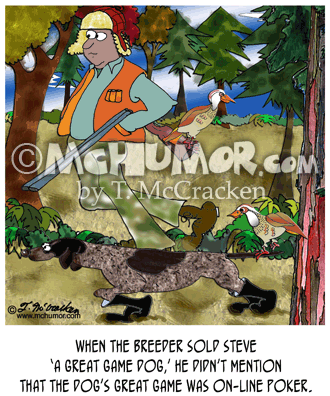 Dog Cartoon 8485: “When the breeder sold Steve ‘a great game dog,’ he didn’t mention that the dog’s great game was on-line poker.” A hunter’s dog doesn’t even notice it has a pheasant on his tail. 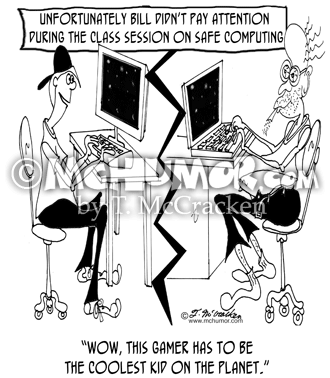 Computer Cartoon 8035: "Unfortunately Bill Didn't Pay Attention During the Class Session on Safe Computing." A kid not realizing an old geezer is the person he's chatting with on the computer says, "Wow, this gamer has to be the coolest kid on the planet."